Estimated tax payments are due September 15. Extended due date for most calendar year taxpayers except individuals is September 15. Watch September 30 deadline for inherited IRAs. IRS issues information reporting guidance for medical insurance. Taxpayer wasn't required to file a foreign account report for an offshore online gambling account. Shareholders were liable for corporate tax. Lessee of investment credit property must include offsetting amounts in income. Payments for Southern California gas leak victims may be tax free. IRS tightens requirements for corporate spin-offs. For summer fun, try reading this murder mystery. Visit our new article: The Next America. Janet and me in front of a glacier, close to Anchorage, Alaska. 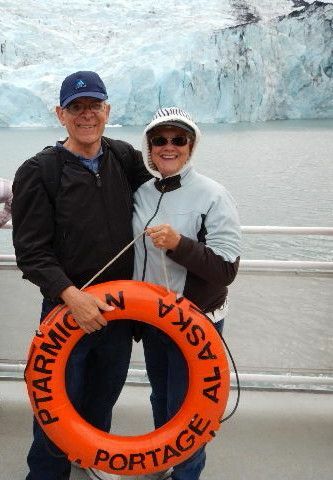 Janet and I shared a two-week Alaska cruise on the Holland America ship, Maasdam, with Janet's sister Gail and our brother in law Lane Johnston. Alaska is certainly a gorgeous state, with glaciers, striking fjords and snow-capped mountain peaks. Then we shared a one-day white water rafting expedition down the South Fork of the American River with our daughter, Holly Baker, her husband Dan, and her children (our grandchildren, Kyan and Clive. Speaking of Alaska, did you know gold was discovered in Alaska on August 16, 1886, 130 years ago? That discovery led to the great Klondike Gold Rush. During our American River vacation in California's gold country, my grandson Clive received a private gold panning lesson for an authentic experience of searching for gold. He learned it was very hard work, requiring a lot of patience. Minerva Siemer, my granddaughter, celebrated her fourth birthday this month. Time skates by! Janet's sister, Gail Johnston, celebrated a birthday. Janet and I celebrated our forty-fifth wedding anniversary. The next due date for quarterly estimated tax payments is September 15. For most taxpayers, there is no California payment due because the first and second payments were "front loaded." The extended due date for filing income tax returns of calendar year corporations, partnerships (including LLCs), estates and trusts is September 15. Be sure your tax return preparer has the information to complete your income tax returns. For an IRA inherited when the owner was deceased during 2015, the designated beneficiaries must be established by September 30, 2016. In order to qualify for an extended payout over the life expectancy of one or more beneficiaries, all of the beneficiaries must be individuals or certain trusts. Otherwise, the account must be distributed within five years after death. A non-individual beneficiary, such as a charity, can be eliminated from consideration by distributing its share by September 30, 2016. See your tax advisor for details. The IRS has issued guidelines on issuing information reports for medical insurance and other health plans for 2016. Some of these reports are still drifting out to taxpayers for 2015. Statements to individuals are required to be issued to individuals by January 31, 2017, like most other information returns. The IRS copy is required to by filed by February 28, 2017, if on paper, and March 31, 2017, if eflied. A taxpayer had two online gambling accounts in foreign countries. The accounts were only used to play poker online. In an unplublished opinion, the Ninth Circuit Court of Appeals ruled against the IRS and found the accounts weren't required to be reported on a foreign bank account form. The taxpayer was required to report another account tied to a financial institution located in and regulated by the United Kingdom, so he had to pay a $10,000 penalty for failing to report that account. A corporation attempted to use losses from a tax shelter to eliminate its federal tax liability for the sale of its assets. It redeemed the shareholders' stock for cash, leaving no cash for the corporation to pay its liabilities. The Tax Court upheld the IRS in disallowing the tax shelter losses and held the shareholders were liable for the corporate tax because the cash received was a fraudulent transfer. The IRS has issued guidelines for companies to qualify as Certified Professional Employer Organizations. A CPEO is a service company that handles federal employment tax withholding and other functions for a client, such as managing human resources, employee benefits, workers compensation claims and unemployment insurance claims. Client companies can shift the burden of employee administration to a CPEO. The CPEO is treated as the sole employer of a worksite employee performing services for the customer or client of the CPEO regarding remuneration that the CPEO paid to the employee. A CPEO can't be an individual or a trust. The IRS must approve an application to be a CPEO. Among other requirements, the company must have annual "clean opinion" financial statement audits, satisfy bond requirements, satisfy reporting obligations, verify periodically that it continues to meet the certification requirements, and adopt the accrual method of accounting. Companies that perform these services should consult with their tax advisors about the requirements and whether they should apply to be a CPEO. The IRS has issued regulations that explain how a lessee of investment credit property must treat offsetting amounts. Investment credit property includes the property eligible for the real estate rehabilitation credit and the solar energy property credit. When the credit is claimed, an adjustment is made to reduce the basis of the depreciable property for 50% of the credit for energy property and 100% of the credit for rehabilitation expenditures. The lessor generally receives the credit and makes the basis adjustment. The lessor can elect to pass the credit to the lessee. In that case, the lessee won't have a depreciable basis to reduce. According to the regulations, the lessee should report income for the basis adjustment amount over the depreciable life of the property, generally 5 years for energy property and 39 years for rehabilitation property. Temporary regulations are effective for investment credit property placed in service on or after December 19, 2016, expiring July 19, 2019. Proposed regulations incorporate the same rules, and would be expected to be effective before the temporary regulations expire. The IRS has announced that certain payments received by victims of a Southern California Gas Company gas leak at the Aliso Canyon storage field, discovered on October 23, 2015 and sealed on February 18, 2016. Victims received payments for relocation (temporary housing) and cleaning from So Cal Gas. The exclusion relates to expenses incurred from November 19, 2015 through May 31, 2016. The exclusion may be claimed by the victims, but not by family or friends who provided housing to the victims, unless they qualify for exclusion under Internal Revenue Code Section 280A. See the Announcement or consult with your tax advisor for details. The IRS has issued proposed regulations that tighten the requirements for corporations to make tax free spin-offs of controlled corporations. The spin-off may not be used as a device to distribute earnings and profits or to avoid the shareholder tax on dividend income. The distributed company must have actively conducted an active business throughout the five-year period ending on the date of the distribution. Although the IRS has been more liberal in the past, it announced it was taking a tougher position when Yahoo! announced it intended to spin off its holdings of Alibaba stock. Corporations planning a spin-off should consult with their tax advisors and study the proposed regulations. Marketing guru Dan Kennedy joined Les Roberts to write a murder mystery, Speaking Of Murder. The location for the story is Kennedy's home town, Cleveland. The murder victim and suspects are based on motivational speaker celebrities and television personalities that you probably will recognize. It is available at Amazon.com or your local book store. Try it; I think you'll like it. August 12, Charles H. Packer, attorney at law, Hopkins & Carley, "Tax planning for real estate change of ownership in California"
August 19 and 26, Charles H. Packer, attorney at law, Hopkins & Carley, "Succession planning issues of family businesses"
September 2 and 9, Michael Desmarais, attorney at law, "But my spouse agreed!" September 16 and 23, Michael Desmarais, attorney at law, "Why don't we just live together?" September 30, Craig Martin, CFP®, The Family Wealth Consulting Group, "The role of emotions in investing"